ACV is used more and more of free range or pastured poultry to assist chooks in digesting or passing grass to reduce being crop bound. ACV is also a mild disinfectant, contains potassium and helps with gut acidity. Our ACV is bottled per order so it retains the Mother, when you receive it you should consider leaving the cap off to allow the Mother access to oxygen so it can stay active and grow. We cover the open cap or lid with muslin to stop flies dropping in. Please note: NOT for human consumption. VirKon S, the premier broad spectrum virucidal poultry disinfectant, is recognised by industry and governments worldwide as a disinfectant of choice for livestock disease prevention and control. Useful as a foot dip for farms, fog nest boxes to minimise disease or disinfection of eggs for incubation only (not for eggs for human consumption). Virkon S can be a useful part of a breeders program. Disinfection of the shell can greatly assist in breaking the transmission of organisms in incubation. VirKon S has been independently proven effective against viral, bacterial and fungal disease causing organisms. VirKon S patented formulation is unique. 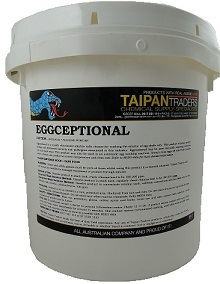 Eggceptional, is a chlorine based egg wash powder, for use with egg washing machines (that clean eggs for human consumption). The powder is dissolved in water or in an egg washer such as Rotomaid immersion egg washer. The pH is alkaline and is not classified as ‘dangerous goods’ so is easier and cheaper to ship than some. We recommend you use with chlorine strips. Eggceptional Q Egg washing liquid has been developed by Bellsouth for the discarded wash solution egg wash machines with brushes such as the Sanitouch egg washers which does not use recycled water. pH is neutral, quat based and an easy to use liquid. Eggceptional Q has a three way cleaning action: quat (Quaternary ammonium cation) as a cleaner, alkalinity to rid oils and ethanol which reduces quat foam and results in a dry egg surface ready for egg printing. Not classified as ‘dangerous goods’. We recommend use with Quat tape. Cleans eggs or plastics associated with eggs such as egg trays, crates, belt etc. Egg Cleanser is a highly alkaline and chlorinated solution designed for cleaning the exterior of eggs, removing poultry soils and waste products, eliminating cross infections of bacteria and pathogens.